After a couple of steady, challenging, yet rewarding days of work...I was ready to unwind with some Rockin' Blues at the old Victory Theater in downtown Evansville. Now the home of the Evansville Philharmonic Orchestra, the Victory originally started as a 1920's Palace of Silent Films. Braving a last minute severe thunderstorm and torrential rain...Sir Hook's Traveling Medicine Show arrived in Victory at the Victory. 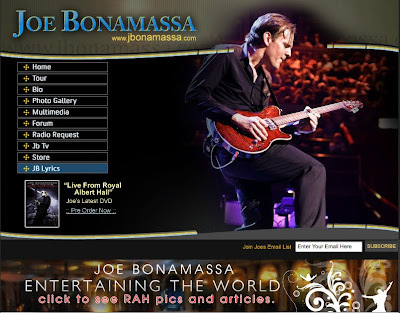 Last night's headliner is one of my favorite guitar players...Joe Bonamassa. Starting as a child prodigy...Joe is now called the "New King of the Blues" and "One of the World's Greatest Guitar Players". Joe is that and so much more...a Rockin' Demon on Guitar...SMOKIN'! The 4th row view from my resolution challenged iPhone doesn't even begin to capture the raw power, energy and sonic beauty that Joe and his solid band mates laid out on the Blues Buffet for our hungry consumption! Like that of John Henry, Bonamassa’s story has its fair share of legend, grit and endurance. Remarkably, the 2009 release of The Ballad Of John Henry coincides with his twentieth year as a professional musician, an extraordinary timeline for a young artist just into his ’30s. A child prodigy, Bonamassa was finessing Stevie Ray Vaughan licks when he was seven and by the time he was ten, had caught B.B. King’s ear. After first hearing him play, King said, “This kid's potential is unbelievable. He hasn't even begun to scratch the surface. 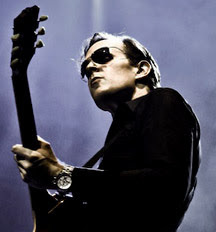 He's one of a kind.” By age 12, Bonamassa was opening shows for the blues icon (something he also did recently as the opener on King’s 80th birthday tour), and went on to tour with venerable acts including Buddy Guy, Foreigner, Robert Cray, Stephen Stills, Joe Cocker and Gregg Allman. Reversing the order for artistic sake, the opening act, and the Gorgeous part of this Smokin' story is Gina Sicilia. All of 23 years old, what makes Gina "Gorgeous" is not so much her looks as the sound that comes out of her Philadelphia bred, Italian American mouth and the energy of the performance. It was like watching Janis Joplin perform while listening to the blended voices of Aretha Franklin, Ella Fitzgerald and Bonnie Riatt all at once....DYNAMIC! Best of all, the songs from her new album, "Hey Sugar", were performed as recorded by a stripped down version of musical mayhem. Upright bass, one snare with cymbal, and an electric guitar was all it took to the ROCK THE HOUSE DOWN! I kept thinking that this is how it must have felt to be at the old Rockabilly shows with Johnny Cash, Elvis and the gang when I was just a spec in my Daddy's eyes! Only once in a great while an artist comes along with the power to cause jaws to drop in awe—ladies and and gentleman, meet Philadelphia's own musical own dynamo Gina Sicilia Exposed to music early on by her music-loving family, Gina began singing at the age of 3 and wrote her first song at the tender age of 12. Upon hearing blues legend Bobby Bland for the first time at the age of 14, she became instantly enthralled by the raw emotion and power of blues & soul. After spending her teenage years polishing her vocal and songwriting skills, Gina began singing in clubs around the Philadelphia area, and has since branched out worldwide. As an artist who has been performing on the blues circuit for only a few short years, it is obvious to see that Gina's star is rising, and it is rising fast. In December 2007, only five months after the release of her critically acclaimed debut album, "Allow Me To Confess", Gina signed with the prestigious Piedmont Talent booking agency, which represents such legendary acts as Johnny Winter and James Cotton. 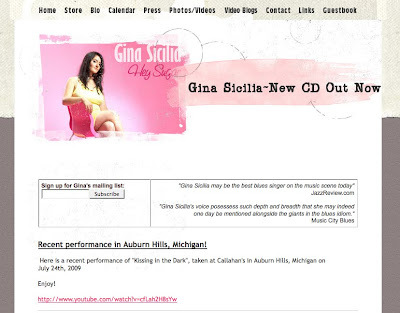 That same month, Gina's impressive talent was recognized by the Blues Foundation, earning her a 2008 Blues Music Awards nomination for "Best New Artist Debut". So, there you have the latest musical exploits from Sir Hook's Traveling Medicine Show. I hope you will enjoy! "It was like watching Janis Joplin perform while listening to the blended voices of Aretha Franklin, Ella Fitzgerald and Bonnie Riatt all at once"